OLDER REVIEWS. 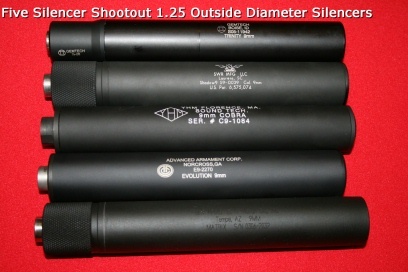 IN MANY CASES THESE SILENCERS HAVE BEEN IMPROVED OR DISCONTINUED. SOME OF THE REVIEWS ARE OUT OF DATE. 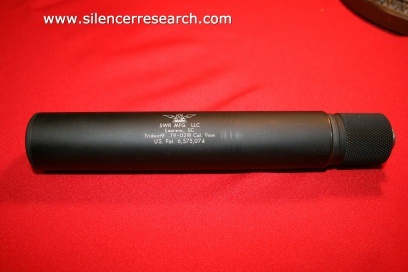 SEE THE PREMIUM SECTION FOR THE LATEST SILENCER TESTS OF CURRENT PRODUCTS. The AAC Prodigy. 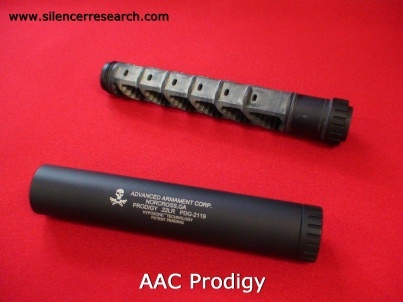 The AAC Prodigy is a unique silencer in that it's design is a single baffle stack/core. This facilitates easy cleaning and easy quick inspection of the silencers internals. I tested three firearms, including a pistol and two rifles. I utilized CCI Subsonics, CCI Standard Velocity, CCI Minimags, Remington Golden Bullet 40 grain rounds and Remington Target/Standard velocity. 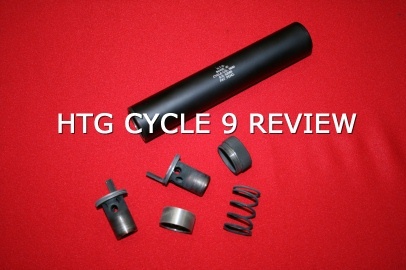 This Silencer has been upgraded as of January 1, 2009 and is improved considerably from these older tests. See the new tests for comparisons HERE. 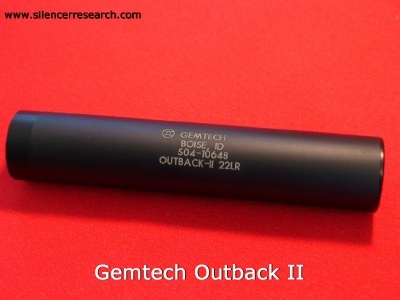 The Gemtech Outback II 22LR silencer. This silencer belongs to a friend of mine. We tested a Walther P22, a Browning Buckmark with a Tactical Innovations 4 inch threaded barrel, a Ruger 10/22 with an aftermarket Tactical Innovations threaded barrel, and a Ruger 10/22 with a match grade Clerke International 16 inch barrel that was threaded by a local gunsmith. Most of the tests were conducted with a variety of CCI 22LR products and some Remington Subsonic rounds. Click the picture. 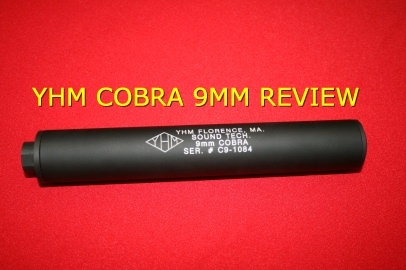 I performed an extensive review of the YHM Mite suppressor. I compared the AAC Prodigy and the Gemtech Outback II. During the testing I discovered several very interesting things that I will cover in this review. Some additional testing occurred five days later. 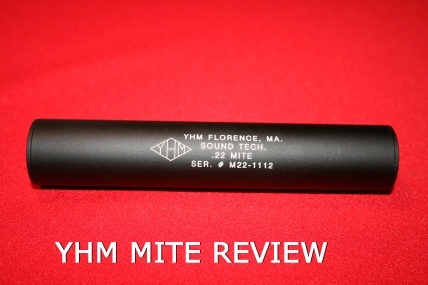 The Mite is a 22LR suppressor that comes apart for cleaning and is full automatic rated. Includes a cleaning video. 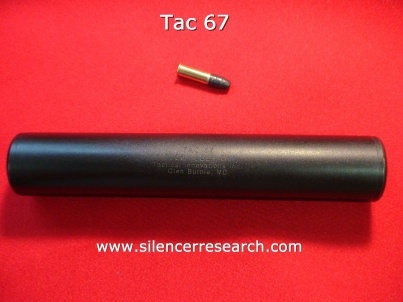 Tactical Innovations “TAC 67” silencer. 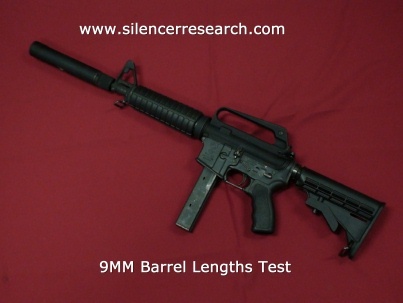 The silencer was tested across 2 platforms with 7 types of ammunition. I tested a factory 10/22 with a aftermarket Tactical Innovations 16.5 inch 1 in 9 twist barrel threaded 1/2X28 TPI. I also tested a factory Browning Buckmark pistol with an aftermarket Tactical Solutions 4 inch 1 in 16 twist barrel threaded 1/2X28 TPI. The Tactical Innovations barrel is capable of stabilizing the Aguila 60 grain SSS round. The Tactical Solutions barrel is aluminum with a stainless steel insert in the barrel. Click the picture. 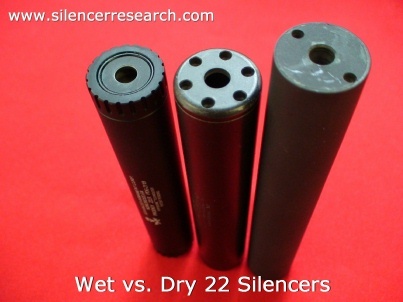 22 silencers both wet and dry. I tested water, UltraQuiet Gel (Ultrasound Gel), and CCF Suppressor coolant. I tested the AAC Prodigy, the TAC 67, and the SRT Comanche using the Browning Buckmark pistol with the Tactical Solutions 4 inch threaded barrel. The ammunition used for the test was CCI Subsonics. 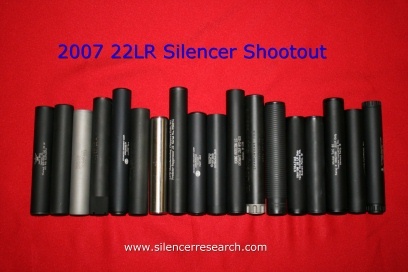 A shootout with three 22LR silencers. For this shootout, I chose 3 unsealed 22 silencers. I used the AAC Prodigy, the Tactical Innovations TAC 67 (no longer produced), and the SRT Comanche. The test was to determine what silencer was best on 3 types of weapons. I used CCI Subsonics for the pistol and rifle shootouts and for the M16 22 conversion, I used CCI Minimags. All tests were completed on the same day within one hour, with the same weapons with ammunition from the same boxes. 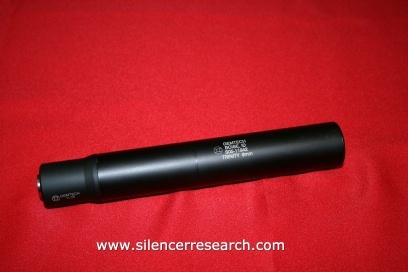 On September 20, 2007 I tested two 1.375OD silencers. In my previous tests I tested two 1.25OD silencers and one 1.375OD silencer. 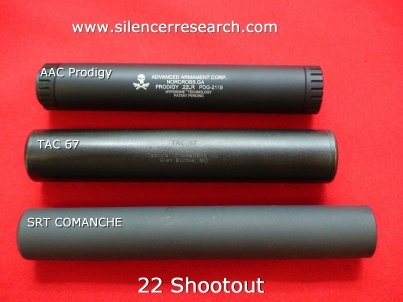 This is comparing apples to oranges to some degree, so I wanted to test the smaller silencers separately. 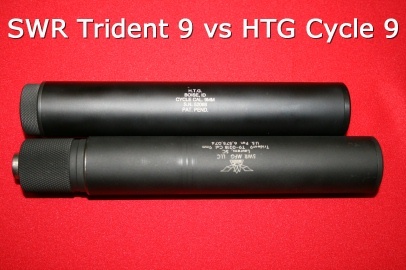 In this test the SWR Trident 9 goes up against the HTG Cycle 9. I tested on a Glock 17 with a LWD match grade drop-in barrel and a Sig Sauer P226 Tactical with factory threaded barrel. Click the picture to see the review. 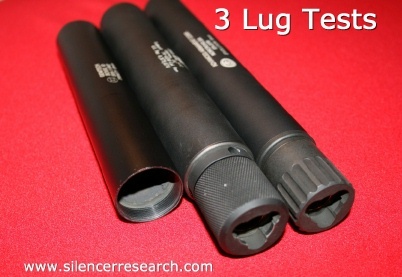 Three lug adapter tests on the Colt 635 style submachine gun upper are available. Includes the three lug system and the thread on mounts. 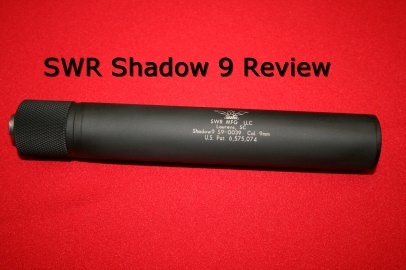 The SWR Trident, the AAC Evolution 9 and the Gemtech Trinity are included. The Evolution 9 seems to make a much better 9mm submachine gun can that it does a pistol silencer. The Evo 9 Triad is tested. Click the Picture. On October 21, 2007 I tested three integrally suppressed 9mm upper halves for the AR15/M16 platform. 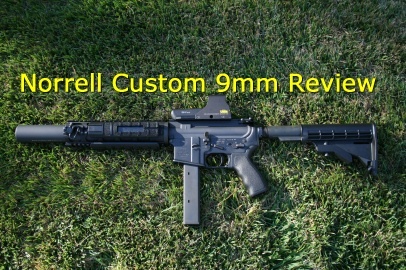 The uppers tested were the LRM M169 (no longer currently produced by the manufacturer), a custom built Norrell DEA upper and the SRT Arms integral upper. The LRM and the Norrell utilize short 9mm barrels and can only be fired on registered short barreled rifles, or registered M16 machineguns. 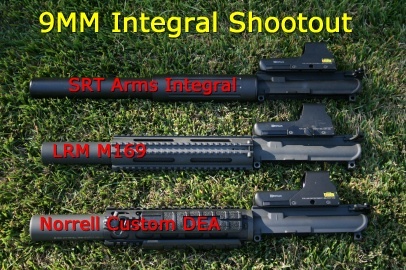 The SRT Arms Integral can be used on any regular AR15 platform. 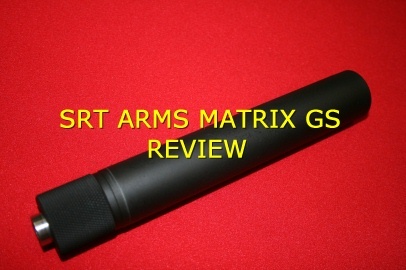 On October 20th, 2007 I tested the SRT Arms Matrix M9. 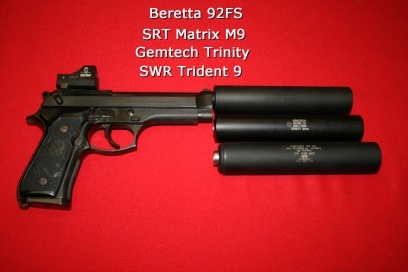 The Matrix M9 was specifically designed to be fired on the Beretta M9/92/92FS/90-Two series of pistols. 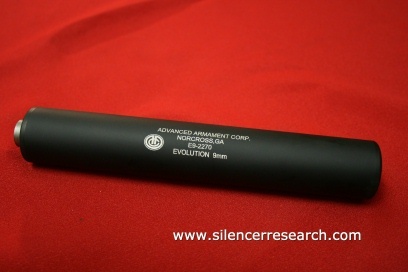 There is no booster used with this silencer since it is lightweight and is not mounted on a browning-type action pistol. The Beretta that I tested was the Beretta 92FS. 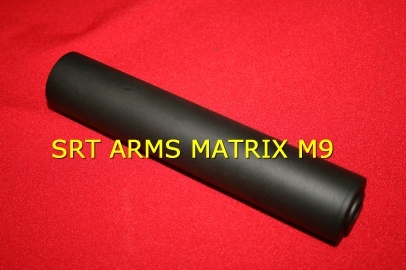 The SRT Matrix M9 weighs a mere 5.7 ounces, is 6.375 inches long and is a 1.25 outside diameter silencer. Click the Picture to read the review.